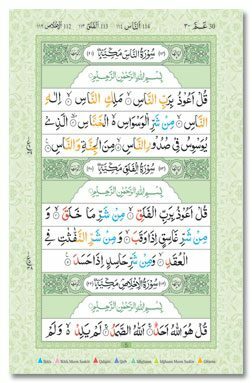 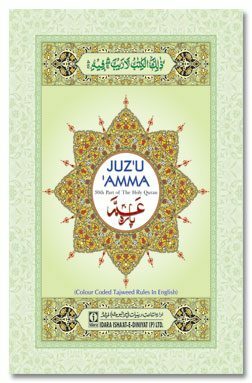 It is a great pleasure for Idara to introduce this Colour Coded Juz’u ‘Amma (30th Part of The Holy Quran) with English Colour Coded Tajweed Rules. This humble effort is an attempt to facilitate the Tilaawah of the Qurân with Tajweed. Seven different colour shades have been used & each colour represents a Tajweed Rule. The colour coding system has been introduced to highlight the Rules of Tajweed found in the Qura’nic text. 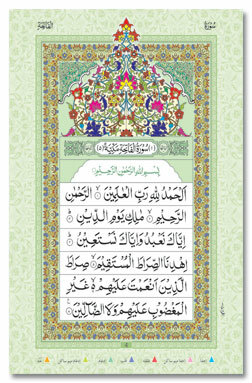 The Tajweed Rule allows the reciter to emphasise the accent, phonetics, rhythm and temper of the Qura’nic recitation. 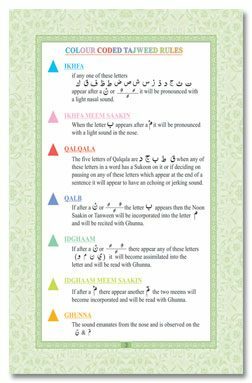 It is imperative for the reciter to have a working knowledge of the Rules of Tajweed in order to know how to pronounce the letters on which emphasis has to be laid.